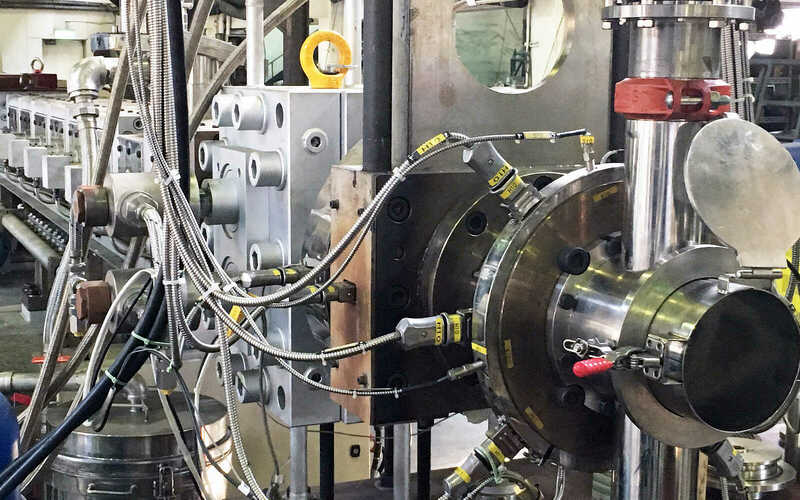 Plastic compounding is a continual, multi-stage process using extruders where polymers and additives are mixed with each other in the melt phase. The discharge materials are dosed in the extruder. The material is mixed into a homogeneous melt in the extruder and then formed into small pellets in a granulator. A gear pump is normally in front of the granulator, which provides constant pressure build-up for consistent granulate. The end products include mono-pigment, additive master batches as well as filler and reinforced-fiber compounds. 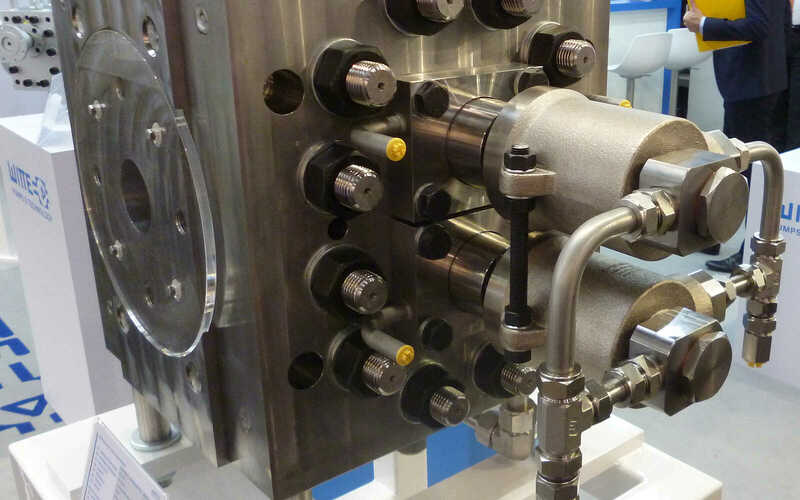 Large gear pumps are used in particular during the compounding of polyolefins such as LDPE, LLDPE, HDPE and PP. Compounding tasks requires constant pressures. The [BOOSTER] series performs this task reliably and precisely. The CHEM series is used for additive dosing in extruders or in prepolymer processing because of its high resistance and flexibility. Melt pumps for extrusion for use behind the extruder. Best choices for low-pulsation conveyance and for combination with screen changers and granulators. The QCC version is particularly suitable for fast color or product changes during operation. The pump does not need to be removed or cleaned for this. Different types of gears are available for the BOOSTER melt pumps in the compounding version. Depending on the polymer used, you can choose between straight or helical teeth, as well as between gears in the standard width or narrower widths. In order to keep the process temperature constant, the shafts of the compounding pumps can be tempered. This ensures the consistent product quality even at higher flow rates, since the temperature of the melt can be maintained at a constant temperature level. The housing of the BOOSTER melt pumps is equipped with heating bores for hydraulic temperature control. The holes are usually set that the largest possible heat transfer surface is available. The temperatures can be regulated precisely. The established WITTE friction bearing technology ensures a reliable build-up of the hydrodynamic lubricant film in the bearings. Special pockets ensure good lubrication film build-up and reliable heat dissipation from the bearings. For secure operation of the melt pumps, these are equipped with a total of 4 threaded shaft seals. For particularly sensitive polymers, the pump can also be equipped with the "Bleeding Bearing technology". The bearing lubrication flow is directed out of the pump through the seal. This avoids any degenerated material due to lubrication, which returns to the product flow and have negatively affects to the product quality. The committee is thereby minimized. The BOOSTER series is well suited for secure and reliable operation in compounding. 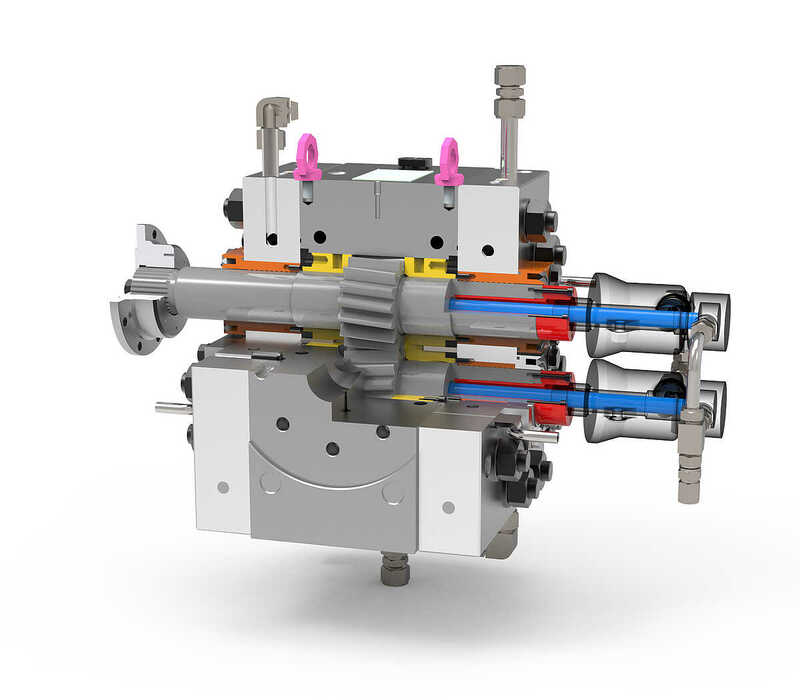 Melt pump for high-viscosity co-polymer in compounding design with cooled shafts and narrower gears for reduced bearing loads. BOOSTER 1900-180-110 melt pump for use in compounding application mounted behind the twin-screw extruder.